The company in charge of moving Broncos gear around the country for every game is Bailey’s Moving and Storage, and they except this load to be four times the norm with everything the Broncos will need to take to Super Bowl 50. But rather than telling us how much, the company is holding a contest on social media asking participants to guess the weight of the load. “A lot of gear for the trainers, medical equipment, gear for the players themselves they’ll use for the game and the practice facility. A lot of pallets of marketing material for the team, media guides, brochures that type of thing,” hints Kevin Beckstead of Bailey’s Moving and Storage. 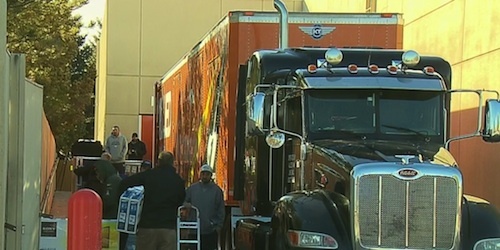 The truck already began loading up pallets of equipment at Broncos headquarters Wednesday morning and Beckstead says that two drivers will be trading off during the 1200-mile journey from Colorado to Santa Clara. Participants are asked to guess the weight of the equipment in the trailer and entries can be submitted here. The three closest guesses will win prizes: First prize is a GoPro HERO 4 Session camera, second prize is a 4th generation Apple TV, and third prize is an Amazon Kindle Fire. Perfect items for truck drivers to take with them on the road. 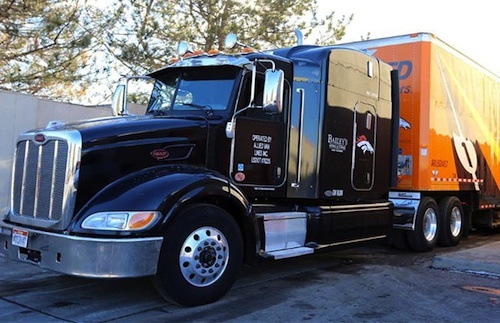 The Bailey’s truck will also be decked out in full fledged Broncos spirit and anyone who spots it during its journey are encouraged to post photos on social media using #BroncosTruck. No matter how much they haul out there, the return trip will not have the TROPHY... PANTHERS ARE THE BEST! Super Bowl Champions! Love to see you win Dave!